.:. Hiking in Big Sur - McWay Waterfall Trail .:. Although the shortest trail in the HikingInBigSur.com collection, McWay Falls should be (and likely is) seen by every traveller along Highway 1. 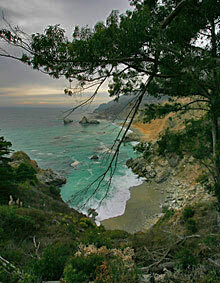 The trail is located in Julia Pfeiffer Burns State Park and provides both southern and northern Coastal views. After parking, walk directly west back towards Highway 1 and look for the sign to the Overlook/Waterfall Trail/Pelton Wheel straight ahead. If you parked in the overflow lot to the south, walk back north towards the lot entrance and the sign will be on your left. You'll head down some short wooden steps, proceed along a wide path and then through a large round culvert tunnel under the highway. Once you emerge facing the ocean, turn right and walk along the wide and well-maintained path for several yards to see the falls. There are several vantage points along the path, typically with a photographer located at each one. For years the waterfall poured directly into the ocean until a massive fire, landslide and highway reconstruction project near the area in 1983-84 filled the cove with enough material to form a sandy beach several dozen feet out. Keep walking a few hundred feet further until the end of the path at another vantage point. Here, you'll see a wonderful view north up the coast, and behind you up the hill, the ruins of the old "Waterfall House" built by Lathrop and Helen Brown. The gorgeous house was intended to be preserved as a museum but was instead torn down by the state in 1965 after a fruitless struggle to save it. If you know where to look, you can still see where the old tramway ran down from the highway to the house. Lathrop Brown was a Congressman from New York and reportedly a close pal of President Franklin Delano Roosevelt in the 1930s. Lathrop also constructed the "Tin House" further north. There is a nice bench under the trees here and plenty of photo opportunities. According to Monterey County Place Names, "The point below the old 'Waterfall House' site has a paralyzing-sheer 80-foot drop to the ocean. A surveyor hired by Lathrop Brown called it 'Poison Point' because 'one drop and you're dead!'" The falls, creek and canyon are named after Christopher McWay, an early settler and farmer from New York state who arrived in the area with his son Christopher Jr. around 1874. The park itself is named after Julia Pfeiffer Burns (1868-1928), a local and legendary early pioneer and resident who impressed Helen Brown and had run a ranch in McWay canyon with her husband, John B. Burns. In recent years, the Park Rangers have been cleaning out invasive non-native plants around the house area (mostly eucalyptus trees) while leaving some of the ornamental plantings from several decades ago intact. The result is better views for visitors, along with a somewhat more native setting. My late father (Marion E. Hanshew) was a ranger at Big Sur State Park from 1960 to 1965. When the property that was to become Julia Pfeiffer Burns State Park was given to the State, we got to know the couple who were the then caretakers. I no longer remember their name. They lived in the house on Highway 1 near which the rails transported one down the steep hillside to the flagstone terrace and the main house. We were invited to tour the property and the house. I am guessing it would have been 1963 but it may have been a year earlier or later. I was a teenager in high school at the time. I distinctly remember the black stone entry foyer with inlaid gold octopus, its tentacles splayed out over the floor, and the enormous stairs descending into the main room below. There were kitchens and service areas to the right that we did not tour. The main room had simply huge plate glass windows overlooking the Pacific. We were told that they had to be covered over in bad weather to prevent shattering. The one impression that I will never forget is of Mrs. Brown's bedroom, the only room in the house that overlooked the waterfall. It was rather small and entirely painted black inside. It seems to me that there were gold stars on the ceiling. There was one large window that was covered with black Venetian blinds. We were told that they were always kept closed. There was only a bed in the room and a nightstand with a plastic radio on it and a lamp. The bed was an antique, I believe from somewhere in Asia, and rather small. Mrs. Brown was supposedly rather tall, so it must have been odd. The bathroom adjoining the bedroom was tiled in blue-black and gold tiles and had inset bevelled mirrors that reflected your image endlessly in all directions. The other thing that stuck with me all these years is that the caretakers had a son. I believe he had been a teenager. He had disappeared before we met the couple. Apparently he had gone to the cove to fish off of the rocks, a favorite pastime. His body was never found and it was speculated that he may have been taken by a killer whale as they frequent the coast line at certain times of the year. As you head back towards the tunnel under Highway 1 from the overlook, you can keep going along the coastal path heading south. This trail will take you over to where the McWay creek falls over the cliff into the ocean, and is worth a look if you have the time. The "Pelton Wheel" trail spur is on your right after you head back through the tunnel towards the parking lots. We've never found this as worthy as the other options nearby, but only takes a moment if you're curious. The Pelton wheel was used by the Browns to power their home and a small rail car that ran up and down the mountain to the house. If you look carefully, the old tracks are still visible out at the house site. 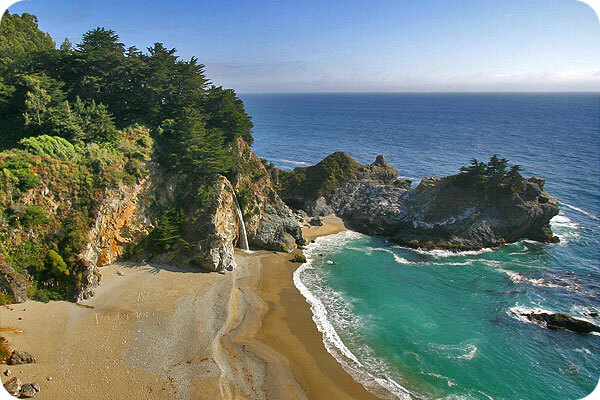 Julia Pfeiffer Burns State Park (3,762 acres) is well marked and easy to spot off Highway 1. The entrance is about 37 miles south of Carmel, or 12 miles south of Pfeiffer Big Sur State Park (note that the two parks have similar names but are 12 miles apart). From the south, the entrance is about 48 miles north of Ragged Point (which is 20 miles north of San Simeon). If you park in the official parking area, signs will lead you west through a tunnel under the highway out to the trail. Visitors can also park for free outside of the park along the west side of Highway 1. If you do park here, you'll want to head south along the highway to a gate in the fence and take the trail to the right. Keep heading north and you'll soon meet up with the regular trail at the tunnel.